I arrived in plenty of time, registered and went to find the Wee County marquee. Gordon had come up for the weekend to support Scott who was running the 24 hour race along with Derek and Graeme and he was kind enough to help us all out for the duration of the race. After catching up with loads of friends it was time to head to the race briefing and get ready to run! 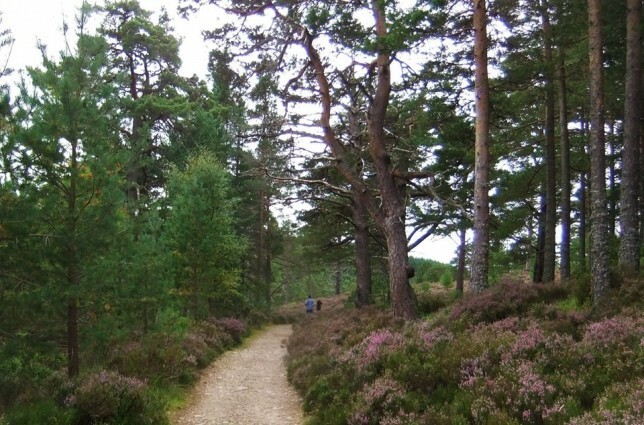 The race set up is pretty simple; you run a 4 mile loop of trail situated in beautiful surroundings of Glenmore Forest, just outside Aviemore for either 12 hours or 24 hours and the person who has run the furthest distance in their chosen race time wins! 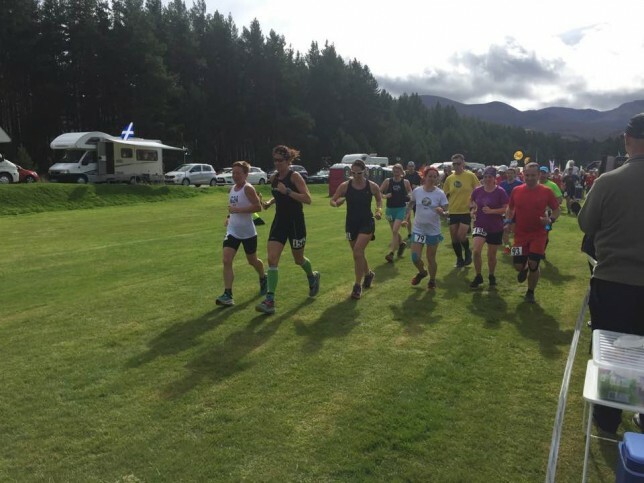 The 12 hour race runs from 12 noon until midnight, with the “wee loop” section opening at 11pm, and the 24 hour race from 12 noon on Saturday until 12 noon on Sunday, with their wee loop section opening at 11am. 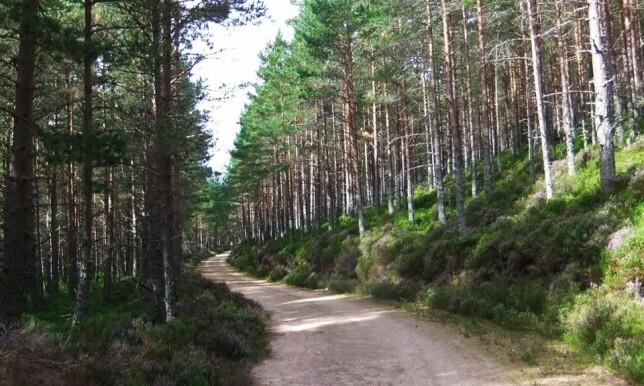 The forest trail loop is 4 miles of undulating forestry track and once the wee loop is open you have the choice to do one more big loop (as long as you make it back before midnight or midday!) or as many wee loops around a 400m track until the race finishes and where you plant a tent peg in the ground that measures your final overall distance. At midday on Saturday, the horn sounded and we were off. The weather was glorious, if anything a tad too hot, and I chose to run the first lap not carrying anything. 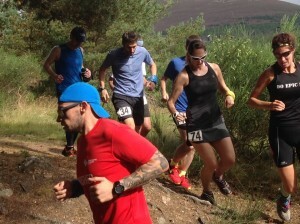 I got off to a pretty quick start running with Victoria Hunter, getting carried away by the cheering supporters as we did a lap of the campsite and out onto the trails for lap 1. I was travelling at a fair clip and I knew I was going too fast, but I was enjoying the chat and ran along beside Victoria until I realised I had just run about a mile up a hill and then decided to let her plod on and I pulled my pace back a fair bit. I completed my first lap, picked up my handheld bottle from Gordon and trotted round to the start/finish line shouting my number to Ada as I did. Lap one complete, only 11 hours and 20 odd more minutes of this! Gleenmore 24/12 hour race start! Lap 2 began with a walk up the hill and I suddenly really began to feel the heat. Karen Wallace and Ruth Howie were supporting and every time I came round the campsite I would see them and get hugs and cheers. I still felt up beat and carried on my run, singing to myself and enjoying my own company for laps 2 and 3 now that the field had spread out a bit. From lap 3 and bit onwards I started to feel pretty rotten and then the mind games started. I was feeling tired and queasy and my enthusiasm had disappeared. I started to walk every incline as my stomach now felt like a washing machine and my head was spinning, and as Graeme, Scott and then Derek all passed me (they were doing the 24 and looked concerned I seemed to have shut down so early on), I started to wonder if I should bother carrying on. What was the point if I was just going to feel awful for another 9 hours, I wasn’t going to run a good race so why not quit? And with that my mind was made up, as soon as I got back to the campsite I was pulling out. My race was over. …or not! No one tells Ada they’re calling it a day 3 hours into a 12 hour race! As I marched towards the timing tent and said I was done, I got given a look and got told to get moving, it was far too early to decide. 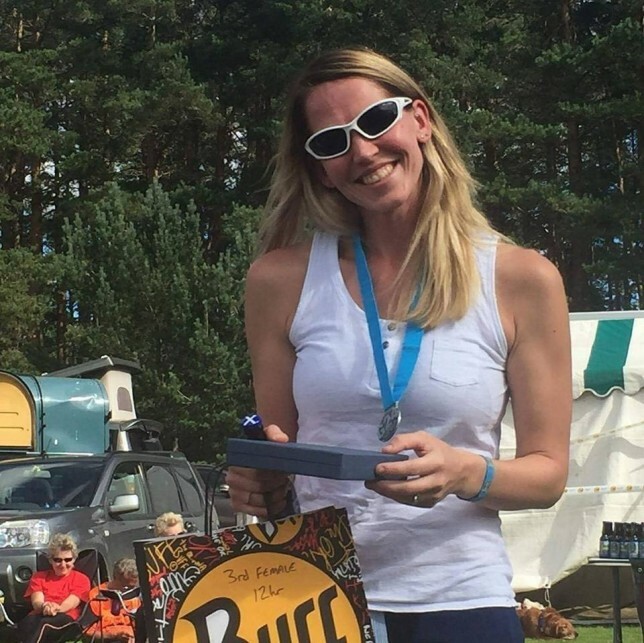 I think my face crumpled and everyone started asking me what they could get for me, but I just felt so queasy and weak that I just wanted to lie down so I marched around the campsite with my tail between my legs where the lovely Ruth and Karen rushed over and basically saved my race. I owe you one ladies! I lay down on the grass outside their tent and Ruth knew once again I hadn’t eaten enough as I had started to go an off shade of white. Karen, the amazing woman that she is, gave me a cold towel for my head, a banana and some water and then encouraged me (with added sound affects) to throw up and I’d probably feel better afterwards. It worked! The banana pretty much bounced off my stomach, and once it was back up (sorry to be so graphic!) I felt like a new woman, and with the encouraging words of “I’m not even your crew, get moving!” I was off on lap 6. Pull out? Yeah, I’ll live to regret that one! By now the field of runners had totally spread out. After walking for another half a mile or so and eating something substantial, I picked my pace back up again. Every so often I’d pass someone or be passed by someone, we’d have a quick chat and then I was back to being on my own again. I felt 100 times better and every time I got back to camp and shouted my number and get a cheeky comment back from the timing tent about having wanted to pull out. By now I was starting to feel so strong and after every lap Gordon did an awesome job of checking I was OK, sorting food for me and filling my bottle if need be, which seemed to be an awful lot; it was still so warm! It was around 8pm when I noticed it was rapidly getting dark. The midges were out in force and no amount of deet seemed to be working today; I was being munched alive and there was nowhere to hide! Armed with my head torch and a long sleeved top I headed out of the camp site onto my 10th lap. It was still quite warm and the sleeves on my top were soon pushed up, but as soon as I slowed to a walk the buff was over my face and the sleeves were back down as the midges descended. If that’s not motivation to get moving, I don’t know what is! After another quick bite to eat and chat with Gordon, I headed off on what could have been my final big lap, depending on how long it took me and also how long a wait I’d have when I got back for the wee loops to open. By now everything was hurting, but I still felt strong and I was still running the majority of the loop. I descended the stairs into the camp site after a super speedy lap and was told I was way ahead of schedule and was promptly kicked back out to do one final big lap comfortably and then have 30-35 minutes of doing loops. Now running in the pitch black, pretty much all alone I was having the time of my life and didn’t want it to end. 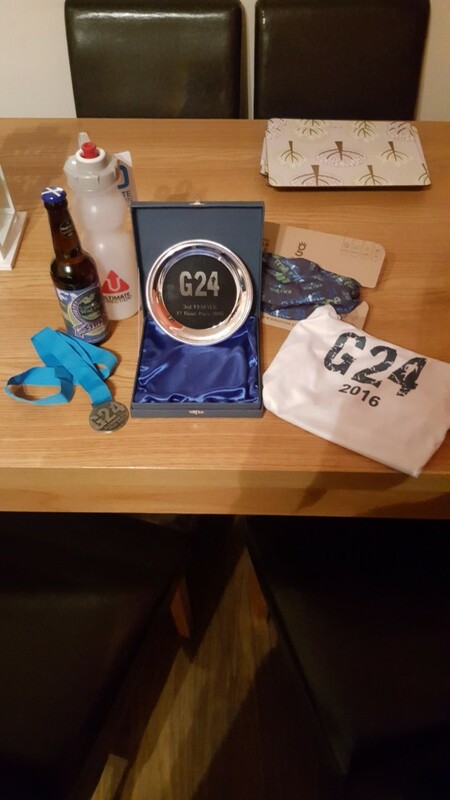 Don’t get me wrong, I was more than happy with my choice of running for 12 hours not 24, but by now I was really enjoying my race. A bit late in the day to be feeling like this! By The time I got back to the campsite the wee loops had been open for a good half hour and the campsite party was in full swing. Everyone was out cheering again, the tunes were being blasted from the party tent and people were screaming your name from all directions. Most of the time I had no idea who was shouting as all I could see was head torches, so I just grinned and slogged on round the wee laps as quickly as I could with a big smile on my face. Finally the horn sounded and I planted my peg in the ground with delight. I’d had a terrible start to my race but I felt I had really pulled it back and was quite excited to find out how I had done. I had a quick wash and change of clothes and then headed back to the campsite to watch the 24 hour race for a while and have some warm food. I did some enthusiastic cheering, had a few drinks and then decided some sleep was probably a good decision, so hunkered down in my makeshift tent of an airbed and super comfy sleeping bag in the back of my car. Surprisingly comfortable and really quiet! I think I got about 3 hours sleep before I was woken to the sound of the 100 mile horn. It was pitch black, I had no idea what time it was and these guys were still going! I must have got about another 2 or 3 hours sleep before I got up and went back over to the field to have some breakfast and carry on my cheering. The last 20 or so minutes of the 24 hour race was utterly hilarious. People started to gain speed, race each other round the track, dance as they ran and the atmosphere was amazing. 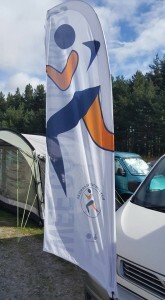 When the race finally came to an end, the tired, sore and broken runners hobbled back to the tents and vans to get changed and then we all gathered for the prize giving at 1pm. 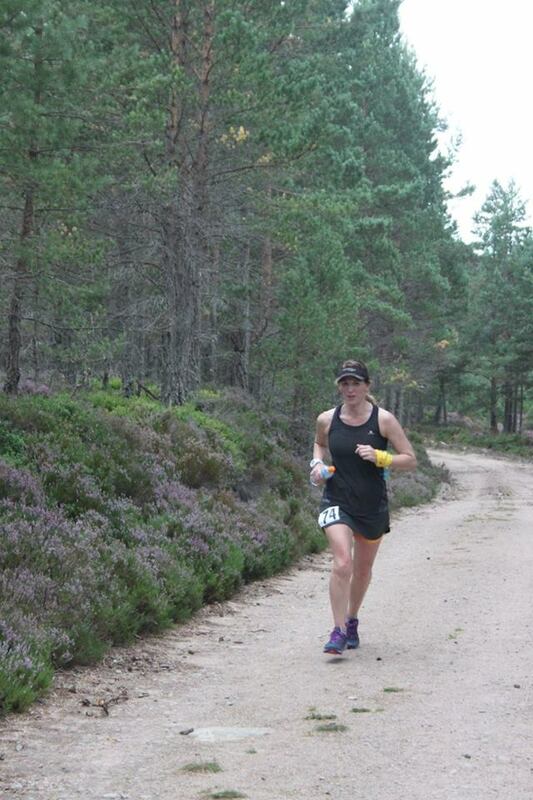 I was absolutely delighted to have placed 3rd lady in the 12 hour race, completing just over 62 miles overall. And with that our weekend was over! 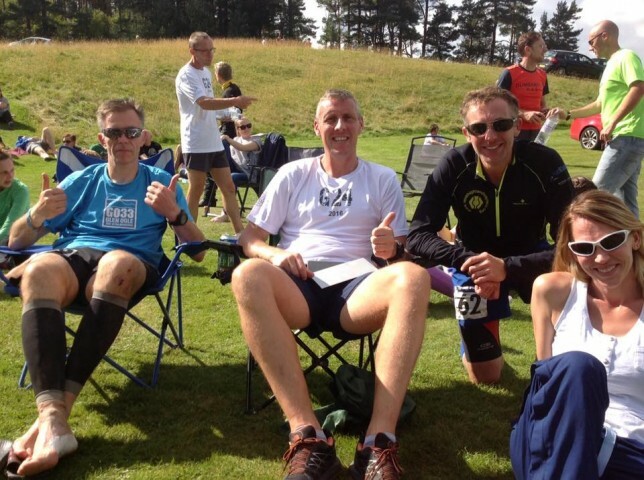 Scott from the Wee County Harriers had a brilliant race, getting the horn and running just over 102 miles overall and Derek and Graeme both running 90+, both having had a super tough season (and a nap in the middle of the night!). BaM swag. Totally worth the pain for the wee haul! Glenmore 12/24 is a brillaint race. Another little beauty from BaM racing and I’ll definitely be back in the future. Thanks to everyone involved for giving up your weekend to marshal and support. As always, you make it what it is! Great blog Iona and great turn around. It’s amazing how being sick can reset the stomach. 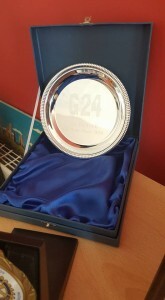 Epic is an apt word for G24.